Thoughts of weymey: World's Best or World's Worst? World's Best or World's Worst? World Best or World's Worst? I was thinking this morning...... about 'oscillation' as defined by my Hussey college Warri Physics teacher. He will say, 'Oscillation - the complete to and fro movement of a simple pendulum bob.' Trust me, it is not the grammar that caused the definition to stick, but the manner he said it. 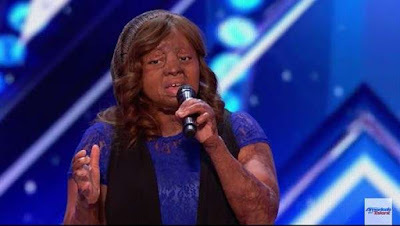 This definition popped in my head when I watched Kechi Okwuchi, one of the two Sosoliso plane crash survivors at the 2017 'America's Got Talent' show. Before she said a word standing before the audience, I was imagining what was going through the minds of the people. On a continuum of 'worst to best,' I am sure most people would have placed her close to worst for her looks. But after she told her story and sang her song, everyone was standing in ovation. The meter had shifted to 'best.' Their impression had oscillated. Hmm!!! Human beings! I am thinking about the practice of qualifying people or things as the world best or worst. While referring to something or someone as the world best seems okay to me, I sometimes struggle with actually condemning a creation of God or man as being the world's worst because considerable amount of resources goes into creating anything. Recently, I became aware of how the FBI building in Washington DC was once dubbed the world's ugliest building. I am also aware that the aesthetically challenged Blobfish was named the world's ugliest animal. But until recently, I never knew there was anything like the world's ugliest colour, described as 'death,' 'dirty' and 'tar.' I was thinking, how can a colour be referred to as world's ugliest? I thought 'adding colour' to something is always positive. Think about it, if the ugliest colour in the world is used to paint the best mansion in the world, will it be the ugliest best mansion in the world? Abeg I am confused. My emotions were still oscillating when I read of the world's ugliest woman. Why would anyone refer to God's creation as the world's ugliest when the bible says we were fearfully and wonderfully made? Though some comedians have given a negative slant to the adjective 'fearfully,' I do not think it is funny. Lizzy Velazquez was born in 1989 with a rare congenital disease that amongst other symptoms, prevents her from accumulating body fat. It is reported that she has 0% body fat, even though she eats up to 60 times a day. She was also diagnosed with Mafgan syndrome. Imagine that with all these 'wahala diseases' coupled with the unimaginable level of ridicule she goes through daily, she was in 2006 given the infamous award of the world's ugliest woman. What a world! As I close my thoughts, I was thinking, how do I define myself? Like the Priests and Levites asked John in John 1:22, you too will be asked 'What do you say about yourself?' Kechi has defined herself after the plane crash, Lizzy Velazquez has answered the question, but truly, how do you define yourself, world's best or world's worst? Health is wealth. The coiner of this words truly knows the meaning. I was down with malaria this past weekend and on medication and couldn't access facebook or my favorite just the thoughts of a certain Wey Mey which I usually look forward to every Sunday. Truly truly, you have said all. How do we as individuals define our selves? You are truly what you think of yourself, don't every let others define you. Your worth is a measure of what and how you feel inside of you. Don't allow some miserable treatment given to you by some persons affect your being. Consider this simple illustration. Take a thousand naira bill, squeeze it, rub it inside mud, and put it in your trash . Does this make it worth less a thousand naira bill? That's you. Always aim to be the best in whatever you do. Life's simple principle' simple living high thinking' apply it and the sky is your limit.